Ruth Bartlett, age 90 of Tracy formerly of Revere, passed away Monday, January 7, 2019 at Sanford Hospital in Tracy. Funeral Services will be held at 1:30 p.m. Friday, January 11 at Church of Christ in Tracy. Visitation will be 5:00-7:00 p.m. Thursday at Walnut Grove Funeral Home with a prayer service at 6:45 p.m. Visitation will continue one hour prior to the service at church on Friday. Interment will be in the Walnut Grove Cemetery. Online condolences may be sent at www.stephensfuneralservice.com . Stephens Funeral Service – Walnut Grove Funeral Home is assisting the family with arrangements. Ruth Ann Bartlett was born August 29, 1928 to Arthur and Stella (Williams) Mathews on the family farm south of Tracy, Minnesota. She was baptized at the Church of Christ in Tracy and was a lifelong member. Ruth graduated from Tracy High School. On June 3, 1948, she married George Bartlett in Tracy. Together the couple made their home near Revere, where they farmed and lived for 61 years. Ruth enjoyed farming with her husband and stayed busy helping him with daily tasks. She moved to O’Brien Court in 2010, and in July 2017 she moved to the Prairie View Healthcare Center. 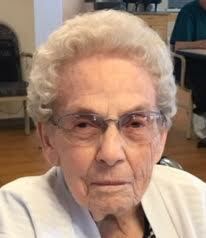 Ruth was a very active member of the Revere Legion Auxiliary. She held several offices and received a pin for 50 years of service. Ruth enjoyed being outside bird watching, gardening, canning vegetables and tending her flowers. She loved music, sewing, crocheting and crafts. Ruth is survived by her daughters: Alice (Galen) Wittenberg of Fifty Lakes, Mary (Wayne) Alms of Walnut Grove, and Jane (Jim) DeSmith of Colorado Springs, CO; grandchildren: Brent (Katie) Alms, Jason (Rachel) Alms, Jill Alms, and Miranda (Mick) Strand; great grandchildren: Amber, Koyer, Riley & Kinley Alms and Bryson Strand; step grandchildren: Summer (Travis) Schoer and Sam & Corbin Vogl; step great great granddaughter Tegan Schoer; sister Ellen Miller of New Ulm, sister-in-law Marjorie Mathews of Canby; and many other relatives and friends. She is preceded in death by her parents, husband George in 2009, and brothers Neil, Russell & Virgil Mathews.